Not unlike many a woman in history who is, nevertheless, relegated — if anything — to the footnotes. But times change, and hopefully, that will, too — or already has. Did the couple have any children? I gather not, but in that case, I wonder who would have been entitled to the compensation that Margaret won? How ironic it would be, as it so often is, that the relatives who spurned the couple should reap those benefits. That’s really called having your cake and eating it, too. I remember this from the Stream, at which time, I was very interested in photos of the house. But this time I found a lovely old postcard showing the island as it probably was during Margaret’s time. I’ve long held that we would have reached parity–not economically, but historically–when women’s accomplishments are put in their historical context, alongside men’s, without reference to gender and without need for a “women’s studies” curriculum. Still not there, but maybe one day. The Blennerhassetts did have several children, but as to whether they survived to inherit the compensation Margaret won I don’t know. I do remember reading in a Jay Robert Nash crime encyclopedia once that one of their sons died in an NYC slum building known as the Old Brewery, but I’ve never been able to find out which son or when he died. Oh, yes. Remember it well. Not often you see a docent anymore. And, yes, too bad. 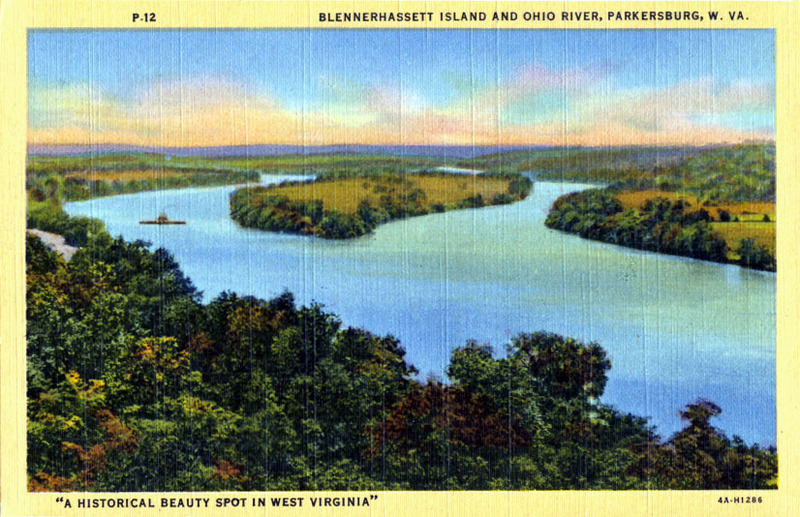 I look at the postcard and think, in the context of the Gulf oil spill, about how much we’ve messed up this great gift we were given.